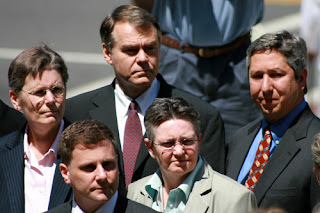 Court was adjourned following Ben's (shown in photo above - front - with some of the plaintiffs) closing statements. If you missed it live, you can view the webcast of today's court proceedings on demand now at www.ctn.state.ct.us. This blog is an excellent new resource. I often feel frustrated that I'm not able to know more specifics about the actual court arguments in gay rights cases. This is a terrific solution. Thanks for creating this blog so that we can get the "play by play" directly from the courthouse. I'ts very interesting reading, and clearly written - the links for background info are helpful too.